Our ever popular Jack the Joker fundraiser continues this Sunday night in Crotty’s Bar where the jackpot is €5,400 as on Sunday night Carmel and Jim were drawn out of the drum and chose card number 1 which wasn’t the Joker but they did win €50. Ritchie Walsh and Jamie Cliffe won €25 each. As well as our group of ticket sellers tickets can be purchased from Village Flowers, Spar, Mousies Takeaway, Minnies Bar, Abbeyside Post Office and Crottys Corner Bar. On Saturday night we held a very enjoyable medal presentation to our Under 21 Hurlers in Minnies Bar. Club Chairman Michael Briggs welcomed all those in attendance and praised both the players and management team for the fantastic job they did in 2016 in winning the Western Title after which Donncdha Enright and himself presented the medals to the players. A presentation was then made to Emer Enright on behalf of all the players, before Michael Briggs brought the formalities to a close with a presentation to Conor Prunty in recognition of him winning an All Ireland Under 21 Hurling medal in 2016. We would like to thank Pat O’Brien and all the staff of Minnies Bar for their help and hospitality on the night. 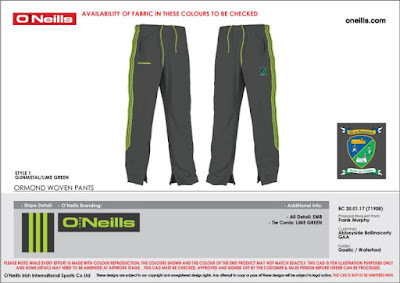 The designs for our new club leisure wear can now be viewed on the club website and Facebook page. So far there has been an extremely good response to the gear, which will be worn by all our teams in 2017 and 2018. It is available from size 5/6 years right up to all adult sizes, and it is open to all our club supporters and players to purchase the gear. As it will personalised with initials we will require full payment upfront when ordering the gear. Orders will be taken in the clubhouse on Friday nights January 27th, February 3rd and 10th from 6:45 to 8pm and Sunday mornings January 26th, February 5th and 12th from 11am to 12pm. This week our club bingo session returns to the CBS Hall with a jackpot of €1450. Our thanks to the management and staff of the Park Hotel for their hospitality over the last two weeks. On behalf of all in the club we would like to extend our deepest sympathies to the family and friends of the late Kevin Dwane, Kilminion, who passed away last week. The Dwane family have given great support to our club for generations and Kevin’s grandson Kevin Dwane was a member of our Under 21 hurling team who won the Western Title last year. Once again we send our sympathies to his wife Monica, daughters Margaret, Michelle and Majella and son Francis. We would also like to extend our sympathies to Michael O’Donovan and Kieran O’Connor on the death of Kay O’Donovan, Ballyduff Upper over the weekend. Kay’s son Michael has been in charge of our pitch for a number of years now whilst he also served a s a selector on a number of County Title winning teams in both hurling and football and of course her step brother Kieran has been involved in the club in many capacities for nearly 20 years now. Kay’s grandsons Shane and Cathal have won man County Titles in the club colours as has her nephew Stephen O’Connor. Once again we extend our sympathies to Michael and Kieran and all of the O’Donovan family on the passing of Kay. 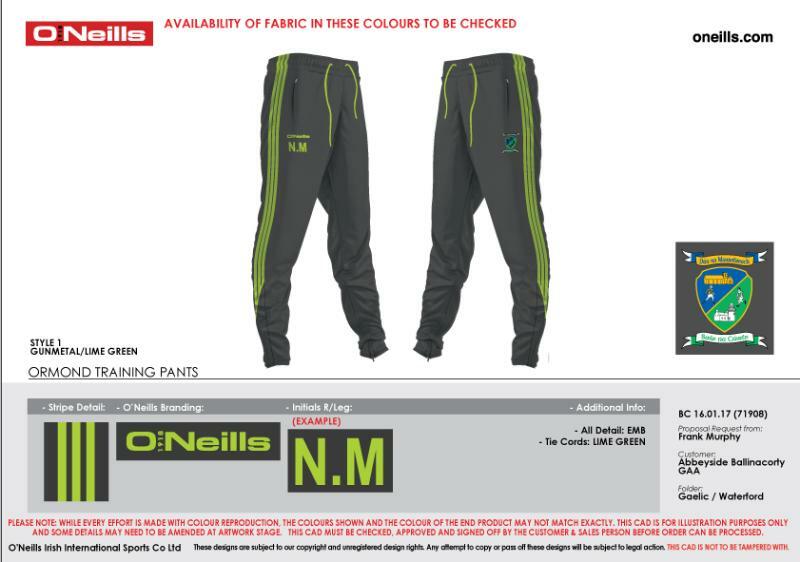 The club has designed new leisure wear which will be available in the coming weeks. Please see samples below. Personalised half zips, polo shirts, t-shirts and tracksuit ends will be available for purchase in both adult and juvenile sizes. Details on how to order will be announced shorty. Our ever popular Jack the Joker fundraiser continues this Sunday night in Crotty’s Bar where the jackpot is €5,200 as on Sunday night Teresa Keane was drawn out of the drum and chose card number 37 which wasn’t the Joker but she did win €50. Jim and Ken and Seanu Kiely won €25 each. As well as our group of ticket sellers tickets can be purchased from Village Flowers, Spar, Mousies Takeaway, Minnies Bar, Abbeyside Post Office and Crottys Corner Bar. This Saturday night at 8:30 pm in Minnies Bar we will be presenting the Western Under 21 ‘A’ medals to our victorious team from 2016. We would ask all our members to come along on the night and show your appreciation to this young team who showed great spirit in winning the Western Title last year. 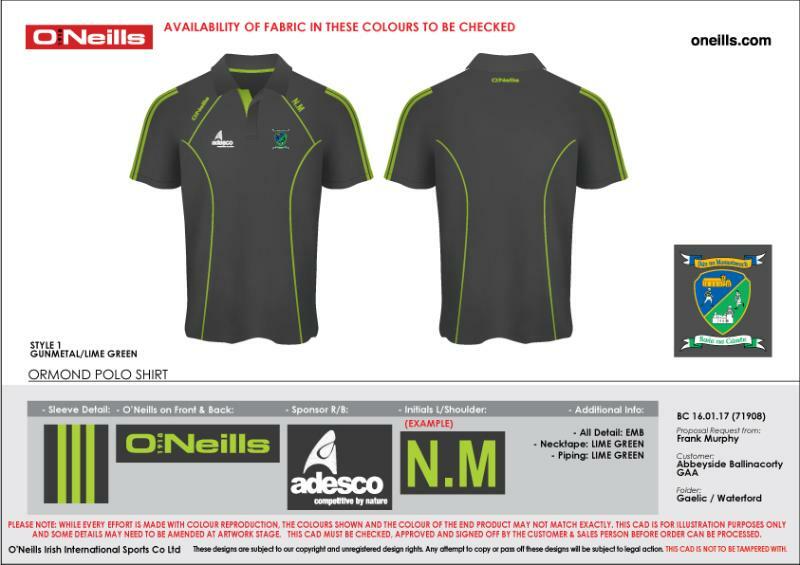 We are currently finalising the design for our new club leisure wear which will be worn by all club teams in 2017 and 2018. This leisure wear will be available to buy directly from the club to all club members from 5 years up, and is sure to be very popular with all our loyal supporters. 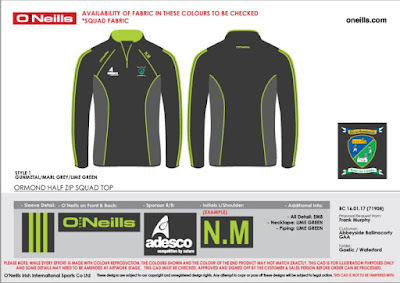 Please keep an eye on our club website, Facebook page and Twitter for details of where orders can be placed. As it will personalised with initials we will require full payment upfront when ordering the gear. This week our club bingo session continues in the Park Hotel at 8:30pm with a jackpot of €1400. Our ever popular Jack the Joker fundraiser continues this Sunday night in Crotty’s Bar where the jackpot is €4,800 as on Sunday night Martina Power was drawn out of the drum and chose card number 23 which wasn’t the Joker but she did win €50. Niamh Enright and Richie Cosgrave won €25 each. As well as our group of ticket sellers tickets can be purchased from Village Flowers, Spar, Mousies Takeaway, Minnies Bar, Abbeyside Post Office and Crottys Corner Bar.